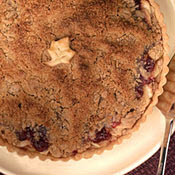 Turn your kitchen into a French pâtisserie for the day and bake this rustic French apple cranberry tart. An ideal dessert for fall and winter entertaining. Line 9-inch tart pan with removable bottom with pastry; trim away excess pastry. Arrange apples in pastry shell; spoon chutney over apples. Bake for 40 to 45 minutes or until apples are tender when pierced with a sharp knife. Remove rim of pan. Serve warm with ice cream.